This year, the Flower Carpet will once again light up the Grand-Place in Brussels, capital of Belgium and the European Union. Intricately and gracefully sewn together, made up of the most colourful begonias, the carpet will be rolled out on the 15th, 16th and 17th of August 2014. Admirers will have the chance to take it all in from above. Practical information: tours will take place from 9 in the morning to 11 at night; a panoramic view from the balcony of the City Hall. Every evening, at 10, 10.30 and 11 o’clock, spectators will witness a splendid sound and light show, set up especially for the occasion. This time, the carpet will be taking you to mysterious faraway lands. We shall say no more for a few weeks yet… but rest assured, it will be enchanting. 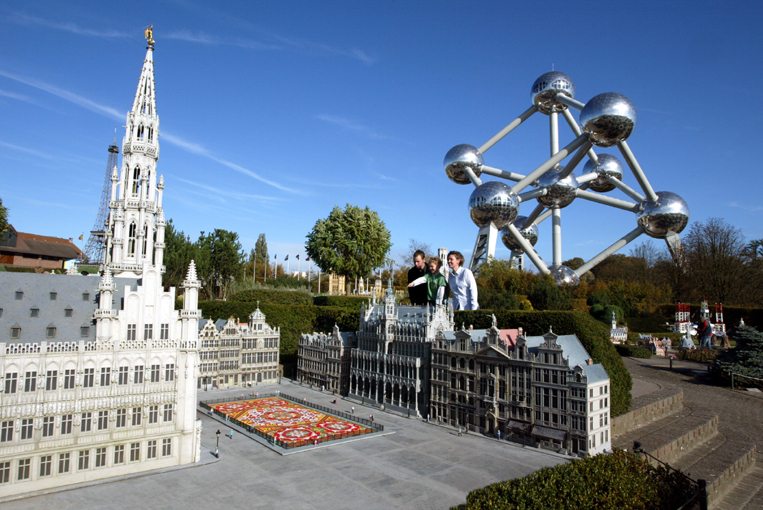 By travelling no further than to the Grand-Place, your senses will be taken on a voyage, as if by magic! The glimmering patterns come together to create an elegant, harmonious floral masterpiece. We follow a single recipe to take you to your destination… relentless work. Very specific ingredients are needed to weave this tapestry of begonias: motivated experts, time to prepare, a flawless technique to bring the tapestry to life, and above all, an underlying motivation to adorn the centre of our capital city… They all come together for this extraordinary challenge. The floral whirls and magnificent arabesques will be on show for 4 days. Go along to take part in this floral encounter and add your own touch to this singular display. You won’t regret it! Did you know that the carpet of flowers is 75 metres long and 25 metres wide? And that it takes 2 years to bring about, as the million cut flowers need to be reserved well in advance? Do you know how the flowers are kept fresh for 4 long days? On the day just before the opening, 120 volunteers bring colour to the carpet, based on a life-sized picture, drawn on micro-perforated plastic which is fixed to the ground and laid down on a fine layer of sand. 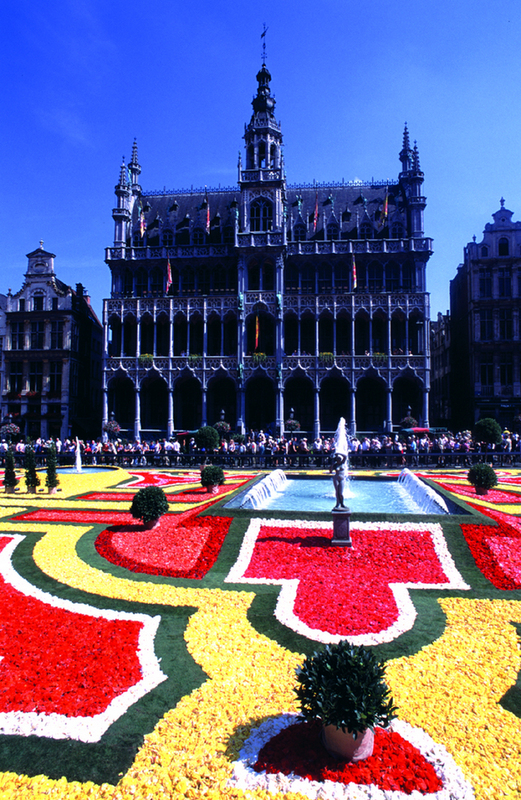 The first Grand-Place carpet of flowers dates back to 1971 and the event you will discover this year is the 19th carpet of flowers to be designed for your delight. The themes are often chosen in relation to current events. A specific cultural event or a historic anniversary represents an opportunity to inspire our designers to excel. 1 800 square metres of begonias for an ephemeral tapestry… a gamble which is both beautiful and very daring. The weather, the number of visitors, the tour within the city hall, timing… all these details are significant. And they all need to be factored in for 3 days and 4 nights, during which the flowers and materials are kept fresh and radiant. It’s your turn to be touched by the magic of this enchanted garden! It will be very pleasant to walk along the carpet 2014 and to experience the perfumes and colours close-up. But there is so much more to say of having a panoramic aerial view of it from the City Hall balcony. From above, the privileged visitors will experience memorable moments where each of them, according to his or her culture and imagination. The spectacle of the entire Grand-Place with its exceptional Gothic architecture and ephemeral and sparkling carpet will be offered to the amazed eyes of its visitors every day, from 9 a.m. to 11 p.m. Admission is EUR 5.00. Children under the age of 10 can enter free of charge. Last, but not least, of the surprises: the inauguration concert will be as wonderful as the magnificence of the carpet. It will add its range of acoustics to the range of colours and materials and will cause our peaceful Grand-Place to undergo a metamorphosis to rise to the occasion and will vibrate, sound and resound. The concert will take place every evening, accompanied by a marvellous light and sound spectacle.